If you are a fan of camping, you have probably heard the name Coleman. They are one of the biggest names in camping equipment and accessories and have been offering quality items for over 50 years. These items include products such as lanterns, coolers, grills, sleeping bags, and pretty much everything in between. 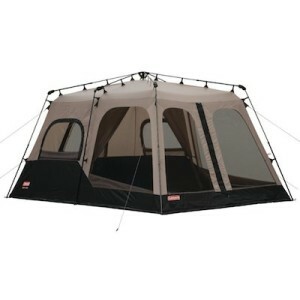 They also make tents, which are a necessity when you are camping. 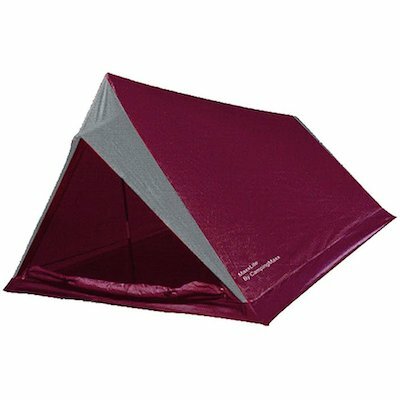 Coleman tents are available in many sizes, colors, and shapes. They also vary in the amount of features they have and in price, and many can be assembled instantly. There are so many different items available, there is no doubt you will be able to find one that will make you a satisfied customer. Here are a few to consider. The Coleman Sundome Tent is a dome-shaped tent that is designed to sleep up to 4 people and is 59 inches tall in the center. It is green in color, with light and dark gray accents. The setup for this tent is quick, due to the specialized poles and pole sleeves. It comes with a bag to carry it in and is relatively waterproof. There is also a lot of interior space so it isn’t cramped. 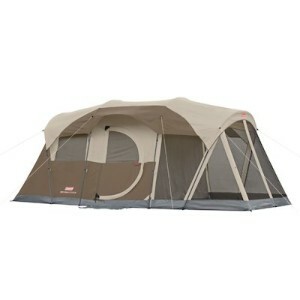 This tent is not only a great price, but it has reinforced seams to help keep it waterproof. Add to that the fact that it is easy to set up and offers protection from the elements, and you have a great product. However, the product may not be able to withstand heavy winds or extreme weather, so it should be used only in weather that is mild. The Coleman 8-Person Instant Tent is a spacious two-room tent. The base of the product is 14 feet by 10 feet, and it has many windows to ensure proper ventilation. The poles of the tent are already attached, meaning set up is painless and can happen very quickly. That also means you can’t really misplace any of the poles. It comes with a removable room divider and is able to comfortably allow for at least two queen-sized air mattresses. 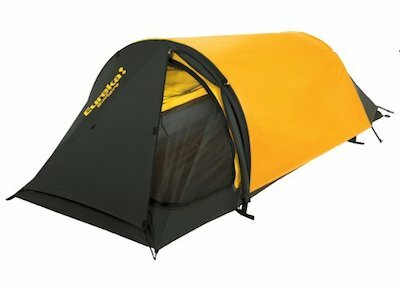 Although this tent is easy to set up, it is over 40 pounds, making it improbable as an easily portable tent. On the flip side, it does come with its own carrying case, is roomy, and can protect you from rain and the elements. Coleman also offers a separate rain cover for this model, which may not be necessary. The Coleman WeatherMaster is a 6-person tent that has many cool features. It is nearly 7 feet high in the center and has a specially designed hinged door, as well as a screened-in room in the front, which can be used to eat breakfast or look outside. It also has extra protection in the floors and a sturdy frame. If you want a tent that will remind you of your home, this is a good one. The fact that it has a door and a type of porch makes this one interesting enough to look at. The fact that you may need stronger pegs and to modify it a bit to keep certain areas from leaking does not take away from its overall appeal. Furthermore, this model has great ventilation, even when it is raining. The best part about buying a tent from a large company is the fact that there are often manufacturer warranties. 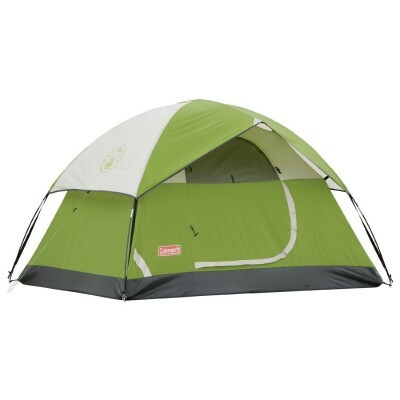 Each of these tents comes with a 1 year limited warranty, but that is really where the similarities end. 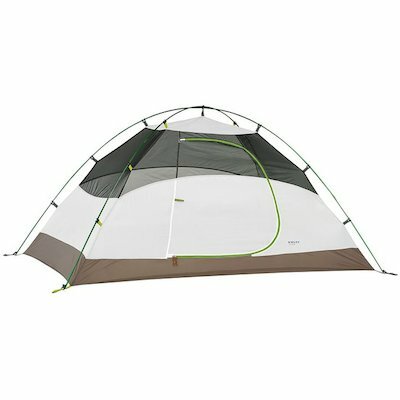 For the best deal, the Coleman Sundome Tent is the clear winner. It is a classic tent that weighs in at less than 10 pounds, so it isn’t hard to lug around. It also has a great price and is easy to put up and take down. The product also offers great protection from rain and is big enough for a small family to use, i.e., two adults and a kid or pet. It also has a port to allow for electricity and a special hook inside so you can use a lantern and not have to sit in the dark. 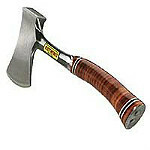 If you have a larger family, the Coleman WeatherMaster is a good choice. It has exciting features that will offer you a bit of luxury while you are camping. With all tents, it is recommended that you put a tarp down before setting up the tent. This will go a long way in making it waterproof, especially on the floor areas. If you do this, there are very few negatives about this product, and the price is pretty reasonable. Finally, if you want a large tent where there is room to spread out, the Coleman 8 Person Tent will offer you that type of solution. Since it is heavy, you will want to be able to park near your campsite so you won’t have to lug it around. Other than that, it offers space for everyone, and the fact that it can be broken down into two rooms makes it perfect for a family with children. When you are packing to go camping, don’t forget about man’s best friend. Consider all the comforts and accommodation you have for yourself and think about if your pet would like some of the very same things. In addition to food and water, he or she will need some protection from the elements and the weather. This means that unless they sleep in the tent with you they will need their own blanket or special bed. These dog sleeping bags or bed come in different sizes and varieties and are made with an array of materials. Great for when you are camping or visiting friends and the pooch comes along for the ride. Some are furry and warm, while others are made of fabric that is waterproof and easy to clean. These products are also designed for different purposes; some are for extra padding and others offer a covering for the dog to maintain body heat. No matter what type you are looking for, there are a list of things to consider, including the amount of support it offers, what size of dog it is for, and what material it’s made of. 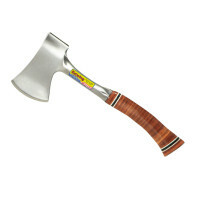 It is also important to note if the item can be used for other purposes as well. For instance, some of these bags are great for indoors or in the car. Let’s look at a few options. This bed is shaped like an oval and looks just like a miniature version of a sleeping bag. 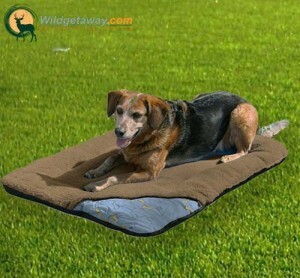 It is designed to be put down in a crate or tent for a dog to sit on, or used in conjunction with other dog beds. It can also be used as a blanket if a dog gets cold overnight. The product is made of a microfiber top and a nylon bottom, which is resistant to rips, even by a dog’s claws. 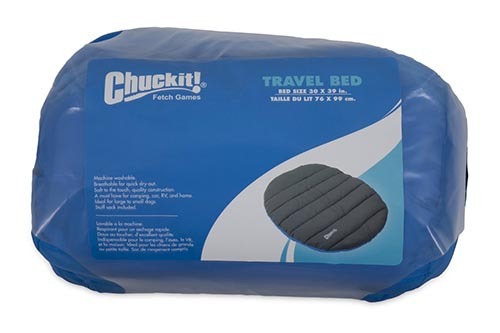 There has been a lot of great reviews on the Chuckit travel dog bed. Everybody says how comfortable and happy their dogs look on them – both big and small. One of the advantages of this bed is that you can machine wash it when it gets smelly. Our dogs love to get messy when they are out and about so having the ability to wash and dry it quickly is a huge advantage. Suitable for dogs of all sizes and you could search online for quite a while before you find a dog bed of the same quality for the price. 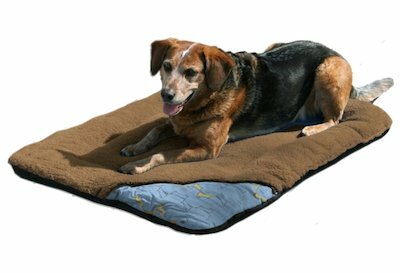 This dog bed is another great option if you are looking for a camp bed for you dog when you hit the trails or campsite. 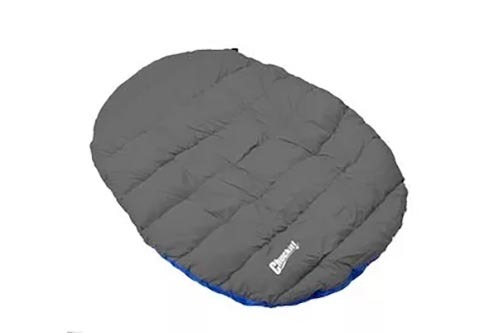 It is very lightweight and packs into a neat stuff-sack so easy enough to carry into the woods or pack it into the car and just unload when you get there. The best thing about this dog bed is the weight and size when packed. You can really compress this down into the stuff sack and if you are a fan of travelling light then this is the bed for you. Because of the weight, as many reviewers have stated you can even get you dog to carry this bed himself. A couple of people have noted that the bed may be a bit on the small size if you have a big dog so check out the size first here to make sure its suitable for your pooch. The Kurgo Wander Bed is just as the name implies. You can use this bed from the house to the car to the campsite. It features a soft fleece top and a rubber bottom, which helps it not slide around, especially in the car. 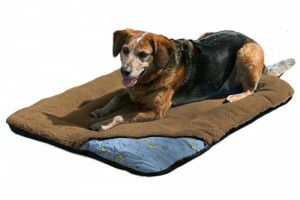 The Kurgo Wander Bed is ideal when you travel with your dog. Stick it on the back seat on the way and use it at the campsite when you get there. The Rufftex bottom will stop it soaking up moisture from the ground at camp and if it gets dirty just throw it into the washing machine. It has a nice thick fleece top that will make sure your dog is comfy when away from home. They even have a zipper pocket so you can pack a favorite toy for when you get there. When we started our research for a suitable camping dog bed we sort of hit a wall. There are a lot of options available and it took a while to narrow it down to the ones we picked. There were a couple of key things we looked for in the reviews we found online. Quality is hugely important as we don’t want them to fall apart after a few trips. This is where the Chuckit! Travel Dog Bed came out on top. It is the easiest on the wallet and also the cutest. If your dog doesn’t need a huge amount of padding or protection from the ground or likes to hide under covers, this is a great pick for them. Besides that, from what we have read it is very durable so your dog would have it chewed into a million pieces in under ten seconds, which is something that is rare in any type of dog product. 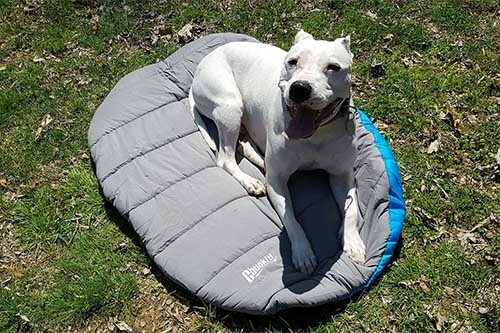 When you are searching for the right sleeping bag for your dog, there are very few things that set them apart from each other. All the products listed above are machine washable, roll up or have a carrying case, and can be used with other items. 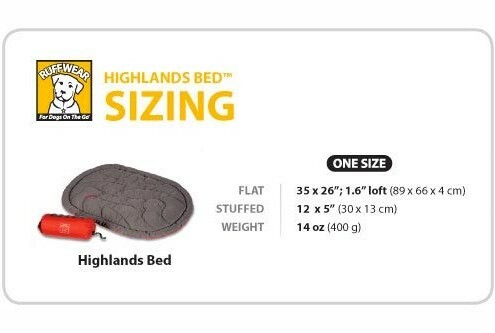 The Ruffwear Highlands Bed may be your thing if you are looking for the greenest solution of the bunch. Some of the positives are that it dries quickly and is lightweight. The use of recycled materials and the fact that it can be secured just like a real tent may be one of the reasons why this product costs more than the others but all the reviews seem positive and many will compliment Ruffwear on their quality products so may be worth the additional cost. These are our thoughts on the best dog sleeping bags available but please do your homework and research yourself if you have the time. If not then for value for money go for the Chuckit Bed. If there is a camping dog bed, sleeping bag, or dog travel bed that you use we would love to hear about it in the comments below and if you enjoyed the information feel free to hit one of the share buttons to help us spread the word. Everybody deserves a good nights sleep – even your dog – no matter where you are. Camping is one of the best ways to reconnect with nature and your family, and has the opportunity to provide some of the best memories of your life. There is something unique and special about waking up before sunrise, walking quietly and calmly to the corner of a lake — or heading into the middle of that lake with a boat — and fishing as the sun rises in the distance. Whether you’re a highly experienced camper, or you’re looking to make family camping a new tradition for you and your children, it’s important that you know what you’re doing before heading out into the wilderness. A great animated image showing you the best way to set up your dome tent. 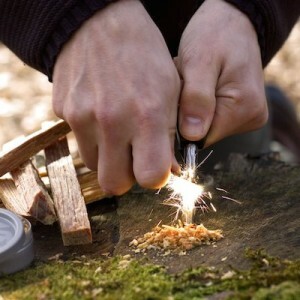 A great animated image showing you the best way to light a camp fire. A great animated image showing you to to catch a fish when out camping. 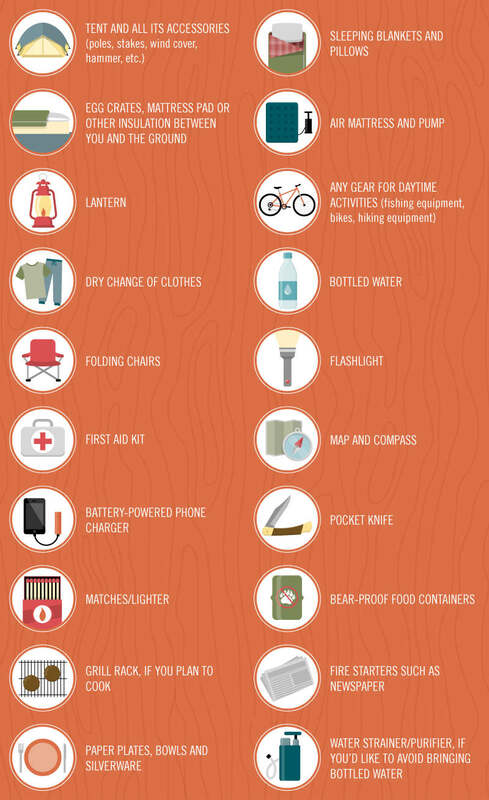 An animated infographic by Personal Creations helps ensure that you don’t forget anything you might need on your camping trip, with a list of 20 essentialcamping items. The infographic also provides simple instructions on how to pitch a tent, get a fire started, and cast a fishing line. You can share this infographic with your kids (or significant other) before leaving for your trip, so everyone is familiar with what to expect once you are all out enjoying nature. If you do go camping and make use of the animated infographics, make sure to tell us about your trip! 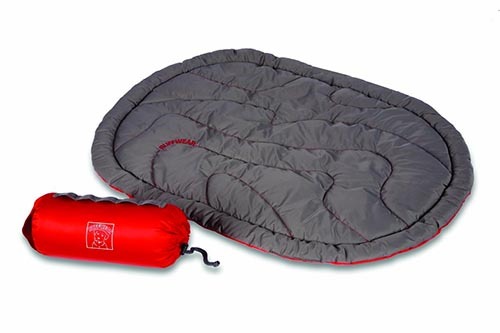 If you, like me are not a big fan of the cold then you need to get yourself a Coleman Green Valley Sleeping Bag. This beauty will keep you warm even if it is only 30⁰ F outside. The bag is made from cotton and polyester and has a built in Thermolock System to stop heat escaping through the zipper which will provide you with endless warm nights of comfortable sleep. The bag filling is locked in place so will not ‘wander’ around as you sleep. This helps keep you warm and avoid cold spots in the sleeping bag and is one of the more comfortable sleeping bags and the best cool weather sleeping bag on the market. This bag is designed more for smaller adults and kids due to it’s size. 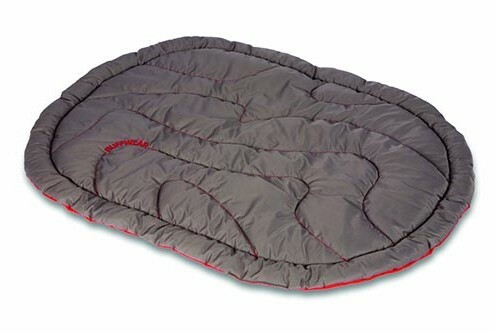 If you are above 5,11 then you may want to look for an alternative coleman adult sleeping bag. 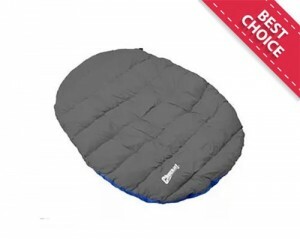 If you are on the hunt for kids sleeping bags then go for it. 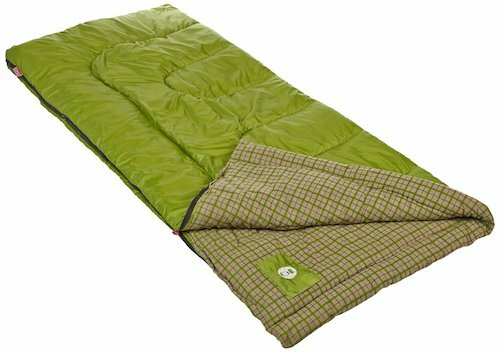 Overall it is hard to fault the Coleman Green Valley Sleeping Bag. If you are worried about camping in low temperatures then this will save the day. Comfortable and packed full of handy features such as the anti-snag zipper and the snug lining, plus the fact that its a Coleman you know you are getting top grade quality. Not a lot to mention here. On reader did say that the inside of the bag was a bit course, but also noted that its because it was brand new and that it would soften up after a few uses. What more is there to say about this sleeping bag. Great price for a great product. Head out on your next camping trip knowing that you are going to curl up in a nice warm sleeping bag and sleep soundly all night long. 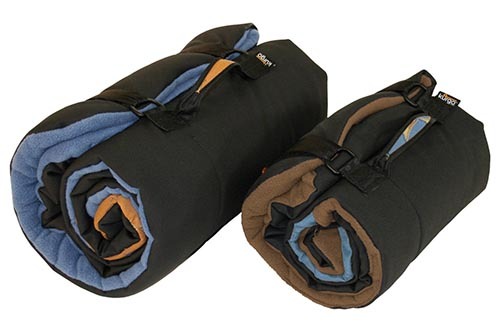 If you have gone out and purchased one of these Coleman sleeping bags then let us know in the comments below how you got on. Would you recommend it to our readers and how would you rate it overall. Feedback is very important to us and its you guys and gals that make all the difference.We hope you enjoyed our review of the Coleman Green Valley Sleeping Bag and wish you well in your quest to find the perfect bag for your next trip. Since the dawn of time man has relied on fire for warmth and cooking. Nothing has changed in the millennia that have passed. 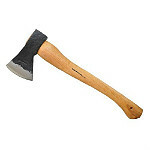 We still used it in some shape or form to survive on a daily basis. Sure there are a multitude of modern appliances and stuff that we use that does not directly need fire to function, but you can be sure that fire was used in its lifetime somewhere along the way. 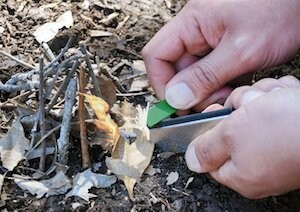 Today we want to review a list of the best fire starter devices that get the job done. Nothing fancy or any marketing rubbish. Just honest reviews that will help you decide on your best fire starter choice. First up is the this little beauty. Cheap and cheerful is always a great option and to be honest if you are looking for something basic to meet you needs or just throw in the bag then you can’t go wrong with the SE. Because Magnesium burns at over 1000 degrees and lights when even the smallest spark hits you could consider this more reliable than a simple butane lighter. 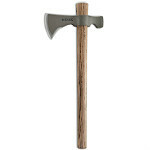 Next up we are going to look at the Light My Fire Original Swedish FireSteel Army 12,000 Strike Fire Starter. This is a high quality firesteel and works extremely well, even when wet. It does take a little practice and you need to understand the basics of fire building to be able to use it effectively. You will need to use good tinder and perhaps practice your technique a few times before you head out and have to rely on it to get a good shower of hot sparks right where you need them. 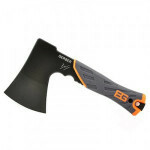 You cant really review any camping or survival gear without considering the Gerber 31-000699 Bear Grylls Survival Series Fire Starter. 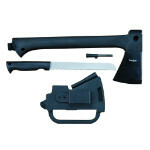 This design features everything you need in a high quality fire starter without the massive price. Very easy to use and comes with a waterproof compartment in the handle to store some dry tinder to get your fire started quickly. Very important in a survival situation. Check out the video below to see just how easy it is to use. Next up is the high quality awesome Aurora Fire Starter 440C. To be honest this is one of the best magnesium fire starters on the market today. Made in the US by Solo Scientific you are getting a fire starter that will outlast most others on the market. Built from high quality materials the Aurora Fire Starter 440C sports a reversible hardened steel striking blade that gets the job done quickly and efficiently every time. 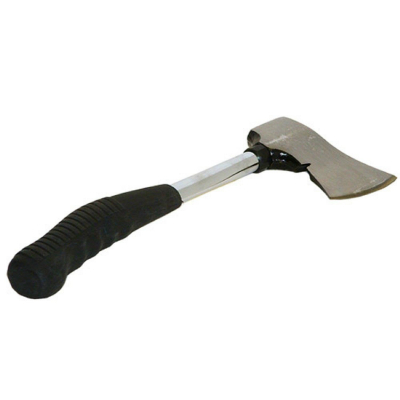 It is strong and sturdy (made from Aircraft grade Aluminium), can take a bit of a kicking and will be suitable in all survival or weekend warrior situations. It comes in at 3.6 inches in length and is 16. oz in weight. Handy design that can fit on a lanyard around your next or just clip it to your belt. 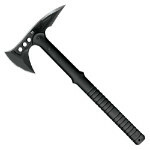 The last fire starter in our arsenal is the Exotac nanoSTRIKER Ferrocerium Fire Starter. Now here is a tool that comes in a neat and tidy bundle. Handy to hang off you key chain so you always have it with you and will even work in the wet. It is self contained as it just pushes back into itself. Made in the USA as well so the quality is top notch. Reckon you would get about 1000 fires out of this one without any hassle. One thing to not is that the striker is very small – hence the nano name, so make sure you are comfortable with this. I have hands like shovels so found this a bit small in my hands when trying it out. We will break this down into three easy to follow steps so as not to confuse you. Step one is to find a suitable location where you want to light the fire. There is no point in trying to light a fire if you are facing a gale force wind or sheet rain… Try to find a sheltered area out of the elements – as long as it is a safe area to light a fire (use common sense for this bit). Don’t try and light a fire in bushes or you may cook more than just your dinner. A pro tip here is to build your fire close enough to a suitable source of material because you don’t want to be wandering around all night looking for firewood to keep it going. Step two is to clear out the area at ground level where you intend to light the magnificent caveman style fire. I prefer to scrape everything back to bare earth and give myself enough clearance around the base of the fire so it does not spread. If you are working in a wet or frozen area then chop up some lengths of branches a couple of inches thick and lay them out under where your fire will go to keep it up and off the wet area – Fire burns much better when its not in a puddle. You might also need to build yourself a wind breaker to shelter your fire from un-avoidable winds. This will also help to direct the heat of the fire back into your camp and keep you extra toasty. 2. Fine kindling such as dried grass. This will be step two and you place the tinder directly in a loosely formed ball of this material to get things moving. Blow on it until the grass or whatever material you decide to use catches a decent flame. 3. Twigs and small branches are next up and can be place right on top of the burning pile of kindling to really get the fire going fully. After that the choice is yours. I tend to have a good supply of thin logs cut from deadfall (dry) piled up a ready to go. These will burn for much longer and produce plenty of heat for warmth and cooking. Make sure when you are ready to leave camp that you fire is fully extinguished and you clean up any mess before you go. If you think about it – you started a fire with just a spark so make sure there are no burning embers left in the fire than could potentially start a new fire without you. If you have a go to fire starter then let us know in the comments below and we would really appreciate it if you click the tweet or one of the social buttons to help spread the word about us. 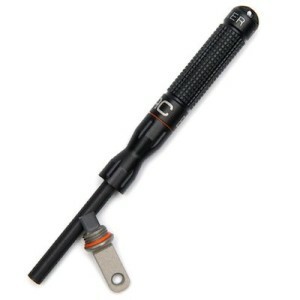 An essential piece of kit for any camping, bushcraft or survival experience is good quality paracord. 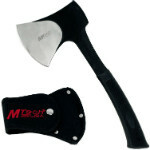 Often one of the cheapest items in your pack it is one of the most valuable in terms of its multitude of uses. The multi strand cord is so versatile that it should be on every kit list on the planet – simply because it does so much. Now not all cord is equal. 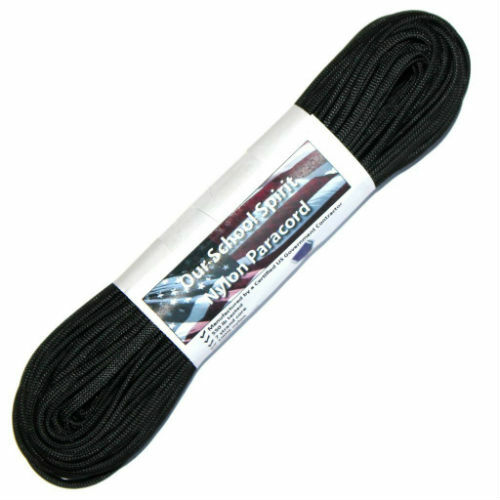 Military grade cord MIL-C-5040H for instance must be made from nylon and pass a list of stringent criteria to qualify. Don’t get me wrong, you don’t need to go for the best quality paracord on the market but for the money involved you are better off spending those extra few dollars and go for a decent brand. You don’t want it to let you down when you are in the field. First lets look at the top four popular paracord options online and see if you can find one to suit your needs. Half hitch. 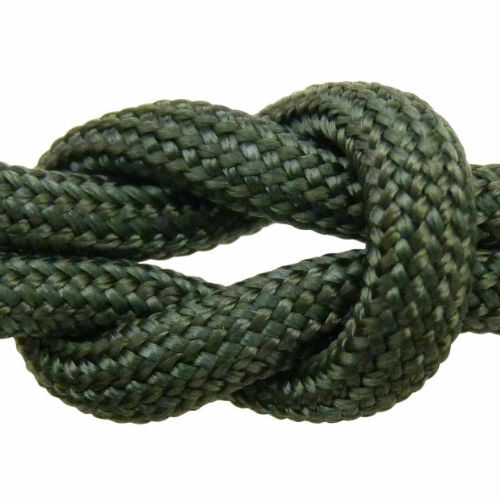 Both the half-hitch and double half-hitch are probably the most useful of any knots used in Bushcraft or Camping. There great for tying off the loose end of your paracord thats wrapped around a tree or tarp, plus you can set them to be very easily opened for quick release when its time to pack up. Siberian / Evenk knot. This knot is great when you are setting up your hammock or tarp and is most commonly used when you are tying up your ridge line to a tree or post. A simple knot to master and once you are confident I’m sure you will use this every time you head out camping. A simple pull of the loose end releases this knot. If you want additional security with this knot tuck the loose end back through the loop to lock it in place. Adjustable hitch. I use this knot all the time to add tension to tent guylines and to adjust the tension on my tar ridge line. Some people go for the common taut-line hitch but from years of use I prefer the adjustable hitch because it holds better and is easier to tie. Clove hitch. The clove hitch knot is a knot also used to tie up guylines. This knot can be made adjustable as well so you can make slight adjustments to how your tent or tarp sits even after its tied off. Bowline. The running bowline knot is a greta knot for tying paracord to trees or tying off branches. Easy to tie and easy to undue after a weight load this knot some be one of your more used knots on camp day. Figure eight on a bight. If you are looking for reliable loop knot for the end of your paracord or somewhere up the line a bit then you should really know how to tie a figure eight knot. Simple to tie once you get the hang of it, this is a very handy knot for camping and bushcraft alike. Stopper knots. The overhand and double overhand are great knots for tying off one end of a length of paracord when you want to lock the line in place. Jam knot. The jam knot is a great knot it you want to tie off a bundle of branches or tree limbs when you are building your shelter. Popular in Bushcraft this knot is a simple knot but has many great uses. Lark’s head or cow hitch. I use this knot frequently when I’m doing work with paracord. I use it to tie my knife lanyard onto my belt or to tie support lines to the end of my hammock. Sheet bend. The sheet bend knot is used to tie cord or rope of different diameters together. If you need additional strength in the knot use the double sheet knot. Just remember that the thinnest line is always fed through the bite of the larger rope. 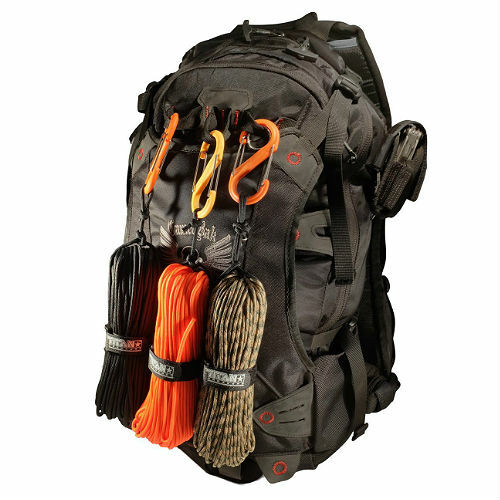 So why do you need paracord in you pack when you are out and about. Lets look into some of the many uses first and then check out the knot tying guide below to see how to put this into practice. First up is slinging a tarp to make a basic camp or shelter. As you know keeping out of the elements in a survival situation is critical to well, your survival. 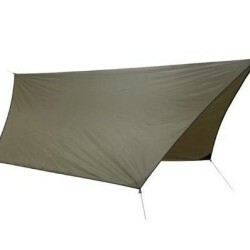 Having a tarp and a length of paracord is enough to build a basic shelter to keep you and your kit dry. The shelter can be put together in a matter of minutes but can really be a life saver. Sling a length of paracord between two trees, pull it taut, throw the tarp over the top, tie it down and thats it. A simple shelter that would do you for a night in the bush. The taut-line hitch knot will be good enough to secure your paracord for the ridge line of your tarp and you can adjust it to remove any sagging. 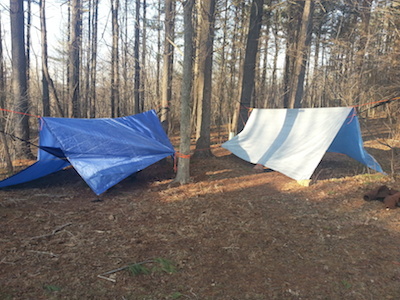 You can find more information on Tarp shelters and the use of tarps when camping on this post. 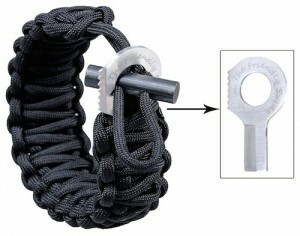 One of the most common uses of paracord when bushcrafting or camping is when you need a ridegline for your tarp. Quite a simple setup and this video explains it all for you. First thing we always do when we decide where to setup camp is to rig up our tarp. 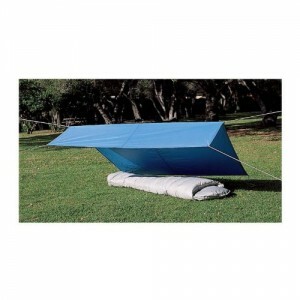 It gives you a focal point for the rest of your camp and keeps you gear dry in the event of a sudden rain shower. 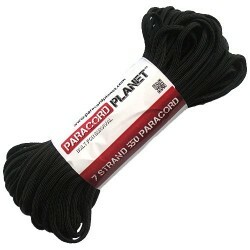 First up you need some reliable paracord to rig up your ridgeline and tie offs for your tarp. There are any amount of brands and styles available online. We use this one all the time that we picked up on Amazon. Great quality and a nice price as well. A 50 foot lenght will cost you about six dollars and thats it. You are also going to need to invest in a good sturdy tarp. Again you have any amount to choose from. Lightweight is best in our opinion because we like to travel light and they compact right down into a very small space inside your pack. Remember when you are loading up your pack to keep the paracord and tarp right near the top as this is the first thing you are going to use when you hit the camp spot. We recommend this one and found it on Amazon for about 70 dollars. Overall a great tarp and its treated so rain resistant. 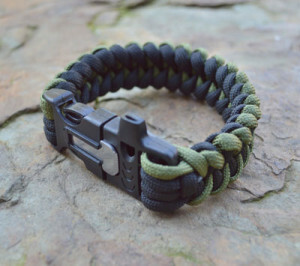 A handy way to make sure you always have some paracord handy is to get yourself a paracord survival bracelet. This will mean you always have some available and you never know when you might need it. This one comes complete with a fire starter and about 17ft of paracord. Enough to do quite a few things in a survival situation. It also has a small knife as part of the setup so its definitely not for kids. The first knot we are going to look at is probably one of the most common knots used not just in camping and bushcraft but for everyday use. Its called the overhand knot and has a great array of uses. Quite similar to the basic overhand knot the double overhand knot is just an additional pass through of the loose end through the knot. A great stopper knot and can come in handy when out in the field. If you are looking for reliable loop knot for the end of your paracord or somewhere up the line a bit then you should really know how to tie a figure eight knot. Simple to tie once you get the hang of it, this is a very handy knot for camping and bushcraft alike. The running bowline knot is a greta knot for tying paracord to trees or tying off branches. Easy to tie and easy to undue after a weight load this knot some be one of your more used knots on camp day. When you want to make a single loop out of a length of Paracord or join two different piece together you should use a granny knot. Straightforward enough to tie, strong and won’t let you down. I often use the sheepshank knot when I want to shorten a length of paracord without cutting it. Takes a bit of getting used to but will save you ending up with loads of short pieces of useless cord. Don’t use it this knot if you are going to be putting a lot of load on as it will slip and let go. Often confused with a granny knot the square knot is really easy to tie and has a multiple of uses. But use it with caution. If your cord or ropes are different diameters, are wet or will come under heavy load then this knot will slip. Are you looking for a knot you can trust not to slip? A knot that will easily come untied after use no matter how much weight is put on it. The bowline knot is the most common working knot around the world and is useful in every situation where a rope is required. The double sheet bend knot is ideal for tying ropes or cord of different diameters together. Popular in sailing this is a really strong and useful knot. Just remember that the thinnest line is always fed through the bite of the larger rope. The sheet bend knot is used to tie cord or rope of different diameters together. If you need additional strength in the knot use the double sheet knot. Just remember that the thinnest line is always fed through the bite of the larger rope. Also known as the pretzel knot the double carrick bend knot is a great way to tie two pieces of cord together. This knot is often used in the construction of paracord bracelets so you should definitely know how to tie it. You have plenty of strength in the paracord itself especially if you went for the military grade cord so make sure the knots you use are up to scratch. We grabbed a few videos from youtube on paracord projects you can make today with just a length of paracord, a lighter and a few miscellaneous bits and pieces. If you are looking for a great paracord tutorial on weaving paracord braid to buckles or handles, making a strap for your watch out of paracord braid or just want to try something different then check out the videos below and have a go yourself. In this post, we address the most versatile item of kit on the campsite: The tarp. The tarp is waterproof, opaque, and handy for absolutely everything. Need a sun-shade over the lunch table? Use a tarp. Pitched a tent? Tarp above, tarp below, you’re staying dry no matter how hard it rains. Forgot your tent? No biggie, the tarp is here to save you. There are a bunch of different options when tarp shopping. Treated Canvas is the great-granddaddy of tarps. Moisture resistant, until it gets packed away, canvas is tough material that will last a long time. Make sure it’s absolutely dry before storing it. That might mean hanging it in the basement for a few days after getting home. Poly tarps like this one are probably the most common. Woven polyethylene layers make for a durable, waterproof layer. Not readily susceptible to moisture like canvas, poly tarps are available in a multitude of patterns, colours and sizes. Good value and excellent protection, poly tarps are notoriously difficult to refold after using. They’re also quite noisy in the wind. Silicone tarps like this one are newer and more flexible than their predecessors. Silicone impregnated nylon makes for a quiet, waterproof, easily packable tarp that has excellent durability and versatility. But how big should this tarp be? Eating in a dry, shaded area is more pleasant than in direct sun. Added bonus: stuff from the trees won’t fall into your food. Keep the cooking appliances well away from the tarp so it doesn’t melt. Even the best rain flies have their limits. Add a tarp for better rain and dew protection. Bonus: your tent won’t get as dirty or hot. Pro Tip: In the rain, put the tarp up a few feet above the highest point of your tent. Then set up your tent under it. Tent stays dry through the whole process, and ends up exactly where it needs to be under the tarp. The best way to keep a tent dry in the rain is to assume it will get wet. By putting the tarp inside on the floor, and folding the corners up (keep some clothespegs handy to keep it in place) water can run in and out as needed without getting the gear inside wet. Depending on the weather, keeping firewood dry might be another priority for your tarps. Their use is limited only by your imagination. Guylines are adjustable, and need to adapt to their surroundings. Braided poly rope (any kind will do, this is one example) will secure the tarp to a tree or pole, or to stakes in the ground. Bring lots. Don’t cut it if it can be avoided. Fewer pieces are better. 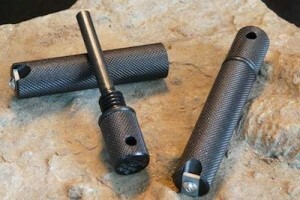 Guyline tensioners like these keep the tension on to keep the tarp taught and avoid flapping. Pegs keep the free-ends in the ground when not tying off to a tree. These are one example. Keep lots of pegs on hand. 6-8 per tarp is a good number. By keeping a ‘kit’ for each tarp ready to go (mark the outside of the bag with the tarp material and size instead of unpacking it every time) it’s one item that doesn’t need a lot of thought in the haste of packing for a camping trip. Now that the size, material, accessories and locations are chosen, it’s time to set up a tarp. First rule: always set up a tarp with an angle. Moisture will build up on the top from dew or precipitation and it’s important to give that moisture somewhere to go. Put the ‘down’ edges of the tarp away from where people will gather, and downhill if needed. Face the ‘up’ edges into the prevailing wind if possible. Ideally, a ridge-line will keep the tarp taught. A ridgeline runs between two trees or poles. The tarp is folded over it (not always in half) to add tension. Tensioning the fabric in all directions will keep the wind noise and movement to a minimum. For a tarp dining shelter, add a few inches above the tallest person in the group for hanging height. When putting a tarp over a tent, consider the weather. In cool weather, the extra layer above will help trap warm air from the campers inside. Keep it close to the top of the tent (even sitting right on it) and stake the ends down low to the ground. In warm weather, allowing air to circulate between the tarp and tent will help keep it cooler. Get the tarp up as high as possible to shade the tent but not trap heat. In the right climate, a tarp can take the place of a tent. A triangular tube with one end going to the ground makes a quick one-person tent (use your trekking pole or hiking staff at the high end to keep it upright). This will keep the inside mostly dry, but not free of bugs nor especially warm. A wind/sun shelter at the beach is another great use for a tarp. A 6 foot ish pole driven into the sand with guylines coming off in all directions and a tarp stretched against them will quickly provide shade and a little privacy, while blocking the wind. The use of tarps is limited only by your imagination. By having the right size on hand with the right accessories, campers will be comfortable, dry and ready to play all day.